Only last night he felt deadly sick, and, after a great deal of pain, two black crows flew out of his mouth and took wing from the room. Want More Crow Quotes? Click Here! While the crow appearing in a dream is sometimes considered a bad omen, a foreshadowing of sadness, this is only one of many meanings. A deeper interpretation of this meaning is that the crow is said to fly between the worlds of life and death and an appearance in your dreams may signify a message about your thoughts on life, death and transformation. Crows are also very intelligent and dreaming about a crow or crows may be a sign of your wisdom or intuition. Your subconscious may be telling you to trust your intuition. The crow is also a symbol of transformation. What part of your life is or may be going through a transition? Maybe you are changing relationships or careers? Maybe you are buying a new house? Whatever it is, the crow is signaling that you are ready to make the change! Is The Crow Your Spirit Animal? 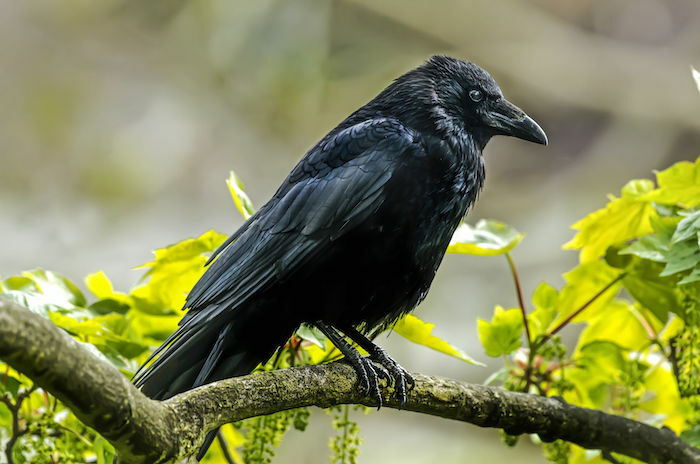 Post your ideas and comments about the crow spirit animal by using the comments below. Is it a good or bad thing to have crows at a fall wedding…doing the typical fall decor..and crows seem to fit. I am a deep believe of a connected universe…past a and present life… That we are all connected in some way to each other. I have had spirit animals in my life always…one way or another. As a child it was horses and dogs.As an adolescent hawks.As an adult certain ones come in and out of my life when the pull or need is greatest. You inspire me.. I too am a Scorpio, and the last 7 years have been birds.. Most recent crows, at first I was afraid because you know what the common world thinks of Crows.. I think they bring peace and transformation. I think there is a lot to be learned from them. I look forward to seeing them everyday now. Had several black crows flying over me, catch my attention. One had a piece of food in it’s mouth while the others followed it. I verbally acknowledged them to the people I was with. Immediately following, I mentioned somethings about someone who passed (almost a year earlier). We happen to be in the exact parking lot where we had last saw them alive (this person did not seem fond of me when alive). Suddenly I stepped on a small rock and ended up breaking my ankle and my leg (severely). Doctors said they typically see those types of breaks in high impact crashes/sports. They could not explain it. Ended up in the ER and had to have immediate surgery. Note: I had just been to an “learning your energy gifts” seminar days before the incident, where I was told that I was an angel and it was suggested I had a direct connection to Meteteon? I do not know my spirit animal and this is all new to me, but my intuition is screaming out that there is sown thing going on. What if anything could this mean? Positive/negative? It is acknowledging your presence and letting you know it is aware of it. It also alerts all other creatures to your presence; but it also wants you to be aware of it and pay attention to its attention of you. That causes me to suspect it has chosen to be your totem animal and act as a guide to/for you. they say crows remember peoples appearance, faces.Unlike other animals. Also they they are the smartest birds.People find them annoying, I know they can be mean. When i looked more into them, i found them amazing.When my cat is outside she dont like the crows. I hear them squawking, they are alerting the cat , to back off. And alerting the other birds. Hello, I woke up to see a crow pecking on my left arm (no the hand), I felt i,t but of course when I fully awoke from the pecking there was no crow there nor was I hurt. This dream – which did not seem to be a dream has not left my mind for 2 weeks…what can it mean? I truly believe the crow is my animal guide. 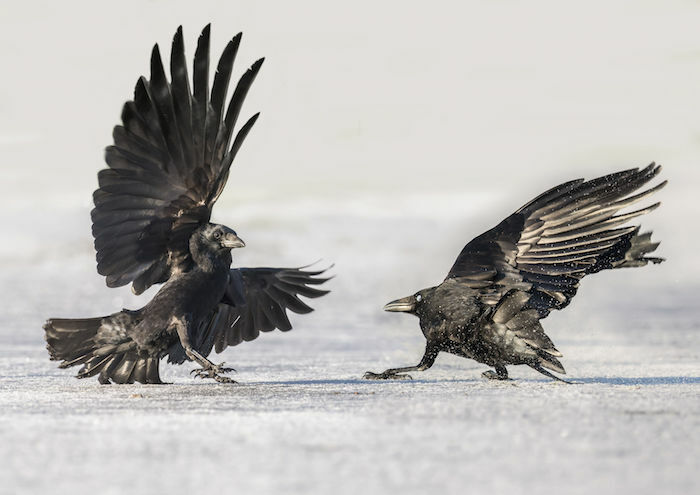 I have always loved crows and Ravens while many people seem to dislike crows especially. A few years ago I was walking alone around a crowded lake path and I noticed a strange man was walking behind me. In order to see if he was actually following me I started to test him and I would stop and sit on a bench every once in a while. Every time that I stopped he would stop too, while every one else would pass me. I kept waiting to see if he would pass me eventually and he didn’t. Then a crow came and perched itself on a bench near me. I would keep walking and the crow would fly up in front of me and keep perching near me. This happened a few times. I wasn’t worried that the crow was a bad omen. I was worried that the man was up to no good and I started to take the crows appearance as a warning. It’s like it was saying if you keep going forward there will be danger. So I finally decided to try and lose the man by getting lost in the crowd. It worked. I lost the man and was able to go back to enjoying my walk. Never had a crow acted like that around me before so I knew I should be paying attention to what it was trying to tell me. Ever since this day I have viewed the crow as my animal guide and I am careful to watch them and see if they want to communicate with me. How weird. I didn’t think anything of it until I took this test and got the crow as a spirit animal. Just this past week, I found beautiful and shining crow feathers on the sidewalk when with a friend. The feathers were wing feathers, there was about three of them, and they were all dropped not pulled. They were in perfect condition too, and had beautiful white tips. I took one home with me and it now sits upon my dresser. But just today, as I was walking about, I saw multiple crows, seemingly in a serene state. They weren’t cawing, they weren’t moving too much, they weren’t even after food. They had circled a tree and seemed almost in a trance. I also saw a roadrunner, a juvenile who hadn’t lost all its baby down feathers. It let me get close to snap a picture, it didn’t try to get away. This was in the same area of the crows and if a crow has chosen to guide me, it explains the roadrunner’s trust, being from the same family. I took this test for fun, but now I’m starting to think this is deeper than it first appears. evr since my son died in car accident we have had one or two crows in yard. every single day. I don’t able to understand that what is it.,,,, when I gone to Terence of my home then so many crows are came and chirping together and try to attack on me… what is this wtf…. what is it..!?? a good symbol or bad…??? plz help me..
Not good or bad just maybe a warning that you have something to pay attention to. I came home last night and a crow was in my living room what does this mean ? I just had an interesting experience while meditating. So after my experience I searched for the meaning of the crow and it all seems to fit perfectly. Out of nowhere I kinda get the very brief view of a crow hopping into my pendant, now all I can recall in snapshot speed details is a worn wooden cabin type deck, and me leaning against the fencing and a crow looking at my pendant and its almost like it and the crow became one with each other. I wonder what it all could mean. I like your story. Your pendant could have been an amulet.Amulets are worn as protection.The fact that the Crow was fusing with it could mean that the crow is your guardian,your protector.He is watching over you.He is your amulet,your protector. i kind of am mischeiveous and like magic and black.